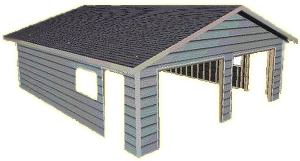 Lewis and Son Roofing offers superior garage design, exceptional construction, and excellent customer service. If you are planning the construction of a new garage or need to replace your existing garage, we're ready to help. We are a full-service garage construction company handling every phase of your garage construction project. We build both residential garages and commercial garages . . . each is custom tailored to the style and size that meets your needs. Any Size - No matter how big or small, we will create a custom garage for you. Whether the garage will hold the family car and some lawn equipment or your entire classic car collection, we can build a garage to meet your specific needs. Storage Capacity - If you can't part with the family treasures, but dont have room to store them in your home, Lewis and Son Roofing will build you a garage to safely tuck them away. If you have recreational vehicles that needs to be stored during the off-season, we will construct a garage to keep them secure until they are ready to be used again. Any Style - We'll assist you in selecting a garage design that will compliment the appearance of your house. Our craftsman can build any style that meets your needs including, gable roof garages, reverse gable garages, hip roof garages, mansard roof garages, flat roof garages, roof deck garages or gambrel garages. We are experts in making your garage an asset to your home and the envy of your neighbors. From start to finish we are a full service garage builder. As a proven resale incentive, your custom garage will pay dividends when the time comes to sell your home. We build both frame and brick garages. Our frame garages can be built with a variety of exterior finishes including cedar, cement board siding, stucco siding or vinyl siding. Our goal is to maintain leadership in garage construction by continued growth from satisfied customers. Our experienced garage designers can guide you through choices to best fit your purpose, budget, and personal taste. You can feel confident we deiver the best value at the most desirable price. Our solid reputation makes your investment an easy and logical choice. Let our garage designers assist you in the design of your custom garage. Contact us for a free estimate. We would be happy to serve you.